A fish finder is one of the most relieving equipment that we can get for fishing. And to get an ideal one, it is important that you go through such reviews where you can know more about the device. You will find a lot of such devices that boast to have many features that are greater than the others. And there are high chances that they will leave you confused while getting one for yourself. For this, we have decided to present you one such product that many fishers are loving. Coming from the brand Garmin, this model has grabbed a great attention of the people. Hence isn’t it important that we put a little light to this model with our Garmin echomap 50s review? Also, if you want, make sure that you check out our Garmin EchoMAP Chirp 53dv review. Let’s start the Garmin echomap 50s review with the most important element of the device: its transducer. 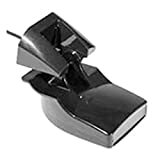 The device comes with a 500W, 77/200 kHz transom mount transducer. And that’s actually quite a lot of power to fish in a very deep lake. Moreover, while you can scan the water column under the boat with 15-degree narrow beam at 200 kHz, you can get good readings with 45 degree wider beam at 77 kHz. Not only that, it also offers accurate tracking up to the depth of 1900 feet in the fresh water and 700 feet in seawater. Moreover, Garmin featuring HD-ID technology is another cool factor that cleans up the sonar returns on the display so you can track fish more clearly. Besides, the transducer features a built-in temperature sensor, so it can indicate water temperature as well. Additionally, you will also find water temperature graph function that provides you the possibility to get better observations to the water temperature variations, depending on currents, depths etc. Another trait that caught our attention for this Garmin echomap 50s review is its mapping option and this device has multiple options for it. You can either have it with BlueChart G2 vision charts or with a map of 5000 US Lakes or waypoints called LakeVU HD. These are great for coastal parts. Moreover, it also has the ability to record the sonar data along with GPS location while you fish and have the sonar data. So you can navigate to various fishing hot spots real quick. The GPS chip on the unit is a newer version that grabs data from multiple satellites. Moreover, it also shows accurate reading called the GPS or GLONASS receiver. Thus, your location can refresh up to 10 times each second, so the usual lag that you check on the readings will be greatly reduced. The best feature of the EchoMap 50s is that it has WiFi connectivity. Thus you can hook it up to your smartphone or tablet and use it via marine-specific apps on the phone you use. Garmin BlueChart Mobile is one such app that enables you to stream SONAR/GPS to your tablet or iPad so you can review it later. The EchoMap 50s comes with a large 5-inch color display that you will find visible even in direct sunlight. The interesting thing is, the display is longer than it is wide, and that provides you more room to see depth. As SONAR is a depth finder at its basics. Hence, it also means that the device will be taking less dashboard space. The navigational information is really reliable. You can upgrade the maps to LakeVü HD, or LakeVü HD Ultra, that increases the navigational potency of the device. Sonar recording helps you record your sonar returns so that you can re-check them or show them to your friends. The unit has 2 card slots and you can use one for saving waypoints, sonar, and other data. The device also features wireless connectivity. It has temperature sensor and temperature graph function. It features a nice clear screen with great screen split options. The built-in basemap package could not impress the users. You may find the split sonar view a bit narrow. You might find many of the main tributaries unmapped. Q: Does this unit come with charts? A: Yes, it comes with very limited charts. Q: Is it Plastic Transom Mount Transducer with Depth and Temperature or trolling motor mount transducer? A: Both transducers will work but if you have an old 6-pin transducer, you need the 6-pin one to 8-pin Sounder Adapter Wire Block adapter if you want to make it work. Q: How long is the transducer cable? A: The cable is about 10 to 12 feet long. Q: Does this unit display boat speed in mph using GPS? A: Yes it does display boat speed in mph using GPS both in Chart and Sonar modes. Q: Can the unit handle waypoints out of the box? A: Yes you can store waypoints and program it while locating your area. Q: Is this unit compatible with BlueChart g2 Vision? A: Although you might find many sites that say that it is not compatible with BlueChart g2 Vision. But according to the manufacturer’s website, they say the unit is indeed compatible with BlueChart g2 Vision. So, from the Garmin echomap 50s review, we can see that the unit has got some promising features that are just there to impress you. 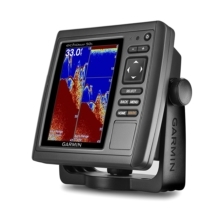 And we all know that when it comes to choosing depth sounders and GPS, the Garmin is always one of the top choices that we enlist. And as for this unit, it has all the features to be a loyal pick and we have already got the proof in this Garmin echomap 50s review.